My first attempt of concocting a story was inspired by two ideas. First, after coming down from a binge of the History Channel, Band of Brothers & Saving Private Ryan, I wanted to write...something. The ideas swirling around in my head were based on how modern western warfare is transparently based on greed and "the continuation of politics by other means", whereas World War 2, albeit a colossal disaster for all mankind, was at least a fight against tyranny. Second, I really, really, really hate it when morons declare that famous historical events would have turned out differently if only they had been there. How they would have prevented that economic collapse, that natural disaster, refused to pick cotton, taught the Black & Tans manners or just killed Hitler and be done with it. So, it's obvious then. I'll write a time-travel movie about people who try to kill Hitler. No, really. What exactly would happen if a team of highly trained modern soldiers suddenly found themselves in Nazi Germany? Would knowing the future actually help? Would killing Hitler be any easier? How would they act? How should they act? Duty? Personal interest? Marooned in the middle of an occupied continent, what exactly could they do? And, most importantly, how the hell did this happen? It interested me as a story once I decided to stick to my "realism rule", where everyone would act as if it were all really happening and not just a movie. 1. After all, no one is going to readily accept they're trapped in the past, regardless of mounting evidence. 2. No one can make it across London in 10 minutes during rush hour. 3. If time-travel were ever to be possible in the future, then surely we would have visitors from then by now? 5. Above all, would their sense of duty still hold? What if it were to conflict with their own needs? Of course, unless you have personal access to someone famous, the usual route to fame & fortune is to get as many producers/agents/actors/distant acquaintances of actors as possible to read it, hoping against hope that someone will acknowledge your genius. Not having the passion for stalking that some writers possess, I sent mine to the BBC Writer's Room. Why? It's the BBC, obviously. Also, it's free. The Writer's Room is a disclosed location where you can send your best writing/typing. Rather than being a direct way of getting your work made into a TV series/film, it’s more of an audition. If they love your work, they may be interested in a relationship of sorts. However, they are merciless, as social conscience Vanilla Ice once observed, to the extreme. You get a mere 10 pages to impress them enough so that they want to keep reading, or they fling your Magnum Opus onto an ever growing pile of crushed dreams, cackling manically one imagines. Anyway, Brad Pitt refused to star in my movie! Turns out, no one will pay me to make my own movie, so I'm gonna learn them good! Armed with an apparently decent screenplay, I had the ambitious notion of creating a graphic novel from it! Since I understand story boarding, I started with that. 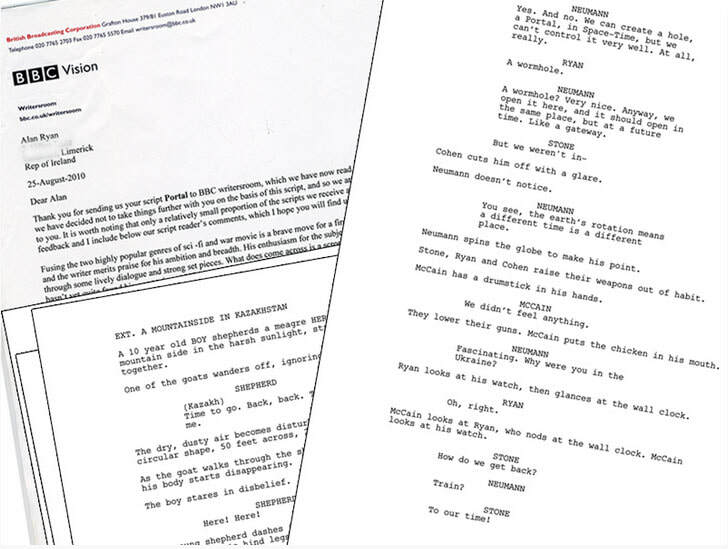 T'Internet revealed that screenplays & graphic novels share a rough correlation regarding page length, so a page of script can usually be contained within a single page of a graphic novel. OK, I can deal with that. I love the screen compositions of Spielberg & Scorsese, and as I started my boards, I could feel real excitement. After all, this is what I would be doing if I was the director with a budget and a crew of movie stars & executives who wouldn't dream of interfering. So, off I went. Rather painstaking work, quite frankly. Days turned to weeks, then months. But, I'm nearly done. People use storyboards to make decisions, change their mind, recompose and so on. When the boards are ready, they can also function as an efficient communication device with your crew of hundreds. Mine look like they were drawn by a child with broken fingers whose artistic ability was never going to lead to riches, only disappointed parents. So, you can't see them. No one can. Ever. But, you can see my proposed solution to the problem of an artist who can't draw creating a graphic novel. That's next.